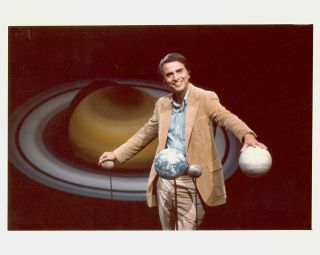 For years, Carl Sagan brought science into homes around the United States with his TV shows and books. Although the famed astronomer died in 1996, his legacy lives on in people who were inspired by his unique brand of science education. Some of the most famous scientists working today had life-changing experiences with Sagan, and other people who never met him still felt his influence from the media he created. Seth MacFarlane is producing "Cosmos: A Spacetime Odyssey." This photo was featured in GQ magazine in March 2014. "We took a big, big hit when we lost Carl Sagan," Seth MacFarlane, an executive producer of the new "Cosmos" reboot said during an event honoring Sagan in November 2013. "Here was a man of science who was regularly in the public eye. He used to appear on "The Johnny Carson Show" alongside big stars like Harrison Ford, Bill Cosby … and he belonged in the spotlight. He was a great popularizer of science, a man who understood that scientific advancement is something that affects us all on a daily basis, whether we're aware of it or not." "Through an old but serviceable telescope from our front yard … my father showed me the moon and the planet Saturn for the first time, and I shall never forget it," said Bill Nye, the star of the popular "Bill Nye the Science Guy" TV show. "Seeing those objects up close changes you, and so it was with Professor Sagan's astronomy class. It has changed me every bit as profoundly as the craters on the moon or the rings of Saturn. He empowered us. Indeed, he emboldened us to come to know our place in the cosmos, our place among the stars — what I like to call our place in space. Every day in his class, there was something astonishing to behold." "The idea was to take a picture of the Earth awash in a sea of stars," NASA scientist Carolyn Porco, one of Sagan's collaborators for the "pale blue dot" photo, said in November 2013. "Well, the actual 'pale blue dot' picture was not really what we had envisioned. As great as it was, there are no stars, and it ended up showing the Earth smack in the middle of a beam of light that was produced by light scattering in the optics of the camera. Of course, none of this really mattered because it was what Carl had to say about this image and the way he turned it into a romantic allegory on the human condition that made that phrase 'pale blue dot' now synonymous with an inspirational call to planetary brotherhood and protection of the environment." "One of the first articles I was given to edit at S&T [Sky & Telescope magazine] was an essay by Carl Sagan," said Rick Fienberg, press officer for the American Astronomical Society. "I was incredibly nervous about touching his words, because he had recently won a Pulitzer Prize for one of his books," he told Space.com via email. "But I made a few changes, mailed them off to Carl (this was in the days before email and before every office had a fax machine), and waited to see what would happen. I got a call from Carl a few days later. He thanked me and said that my changes had improved his essay. That gave me a real confidence boost, and the rest is history — I went on to become president of Sky Publishing and, later, editor-in-chief of Sky & Telescope." Space.com readers also remember Sagan as an inspirational figure. "It is one of the clearest memories I have from my childhood in Brazil," Fausto Pereira told Space.com via Facebook. "I would wake up in the Sunday mornings and watch his [Sagan's] show all by myself because my family was still sleeping. I was like 5. I still feel goosebumps when I hear the music from the show. [It's] one of the reasons I love astronomy and science!" "He [Sagan] invited us to join him on a journey to understand the universe; not as a passenger on his ship but as a fellow explorer," Jatinder Brar told Space.com via Twitter. Tell us how Sagan influenced you in the comments below this story.